Make learning Hebrew fun by reading I Have a Wocket in My Pocket in Hebrew! Beny Ben Boony Matay Kvar Telech? 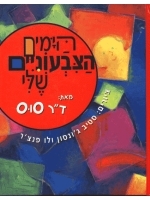 Make learning Hebrew fun by reading Marvin K. Mooney in Hebrew! Happy Birthday By Dr. Seuss in Hebrew! The Cat's Quizzer in Hebrew! Make learning Hebrew fun by reading Green Eggs and Ham in Hebrew! The Cat in the Hat Comes Back in Hebrew! The Dr. Seuss children's classic in Hebrew! This book is a great tool for teaching Hebrew to children of all ages.